The Carding Shed is found in Hepworth, near Holmfirth, West Yorkshire. The Carding Shed first began when IK Classics, first established in 1998, moved to the current premises. The space offered by the move allowed for the two family business, IK classics, a classic car garage with a passion for restoration, and Nicola’s Gateaux a popular bakery, to be combined in the form of a vintage tearoom with a classic car display. The original aim was to sell around 35 cups of tea and a few slices of cake per day, less than 5 years later and the business has grown beyond all expectation into a thriving visitor attraction receiving on average 6,000 people per week! Named after the original purpose of it’s new location “The Carding Shed” has built into a multi-venue attraction based around a vintage theme. 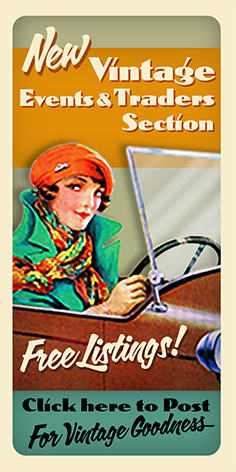 It is a lovely place to visit for the car, coffee, and vintage enthusiast! Combining a Classic Car Display, Vintage Clothes Shop, Antique and Retro themed gift Emporium offering local hand made gifts, and the amazing Oil Can Cafe serving freshly made Breakfasts, Lunches or Afternoon Tea all made from locally sourced products. Take a break from the rush of modern life and take a step back in time to a more sedate era, linger over an Afternoon Tea, while away the hours catching up with friends and sample the homemade delights on offer in our cake display. Open 7 days a week, including Bank Holiday Monday's. If classic cars are your passion then IK Classics Early Morning Garage Tour & Breakfast is a popular attraction, with tickets usually booked out months in advance. Arrive at 9am for a large breakfast in The Oil Can Cafe, followed by a tour around the current projects in the Workshop & Bodyshop with garage founder, Ian Kellett. Please call 01484 680400 for ticket availability. Also situated within The Carding Shed is 'High Society Vintage Clothes’. Offering visitors the opportunity to find beautiful hand picked retro themed clothing with old fashioned customer service. The Oil Can Cafe, where you can take Afternoon Tea serviced in bone china and sample some of the delicious home made cakes.